A new private resort retreat has opened on the west end of Grand Bahama Island. Nandana is a private resort designed in the style of a Thai beach mansion. The retreat offers 18,000 square feet of living space and comes with a complete staff that includes a chef, masseuse and boat captain. The Lioness, the resorts’s 43-foot yacht, is available for fishing, scuba or other aquatic adventures. 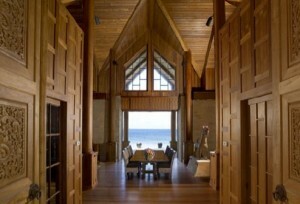 The main house has living and dining areas with a 40-foot-high ceiling.Sliding-glass doors open out to a 120-foot-long infinity pool overlooking the sea. Five one-bedroom suites surround the main house: two 1,000-square-foot beach front pavilions, two garden bungalows and a 2,000-square-foot luxury canopy suite. A landing strip allows guests to arrive by private jet, or they can dock a yacht at one of two dock sites which hold yachts up to 100 feet. In the upcoming High Season, January 4 – May 31, 2010, the resort rents for $6,500 per night for up to six people or $10,000 a night for ten people.